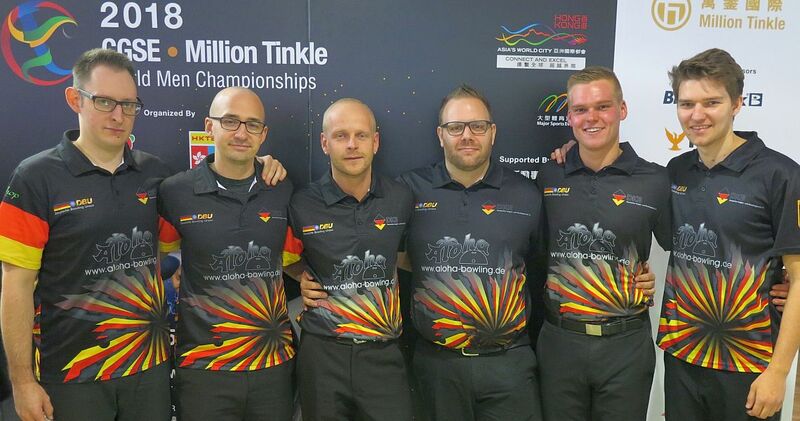 Germany leads the team preliminaries in the 2018 CGSE • Million Tinkle World Men Championships as the 41 five-player teams have completed the first three games of six-game event at SCAA bowling center in Causeway Bay, Hong Kong, China. Fabian Kloos, Pascal Winternheimer, Oliver Morig, Tobias Börding and Frank Drevenstedt of Germany set the bar in the first squad with 3200, an average of 213.33. 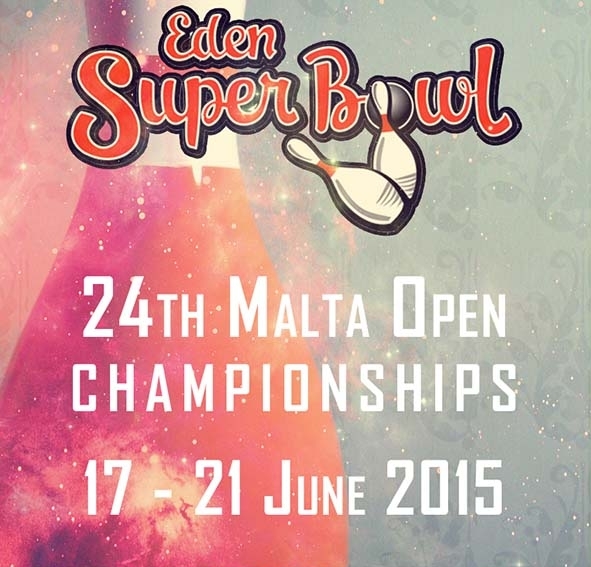 Places 2 to 6 belonged to teams from Squad 2. 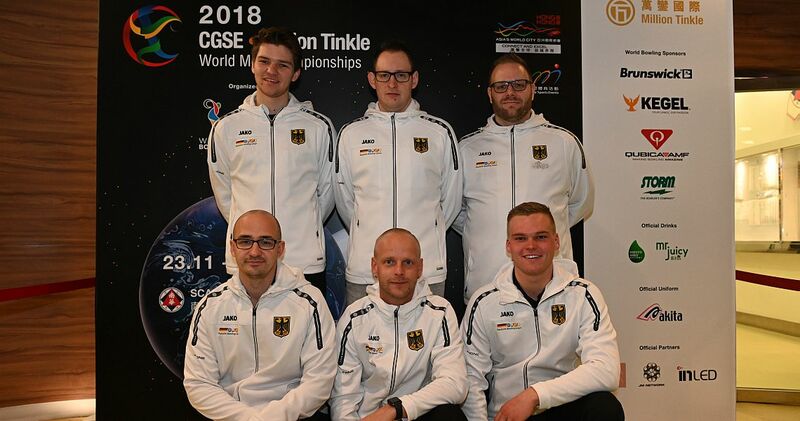 Featured photo from top left, clockwise: Squad 1, Block 1 leader Germany: Tobias Börding, Timo Schröder, Oliver Morig, Fabian Kloos, Frank Drevenstedt and Pascal Winternheimer. 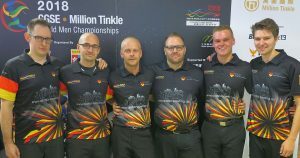 Valentin Saulnier, Maximilien Fialon, Thibaut Lanos, Julien Sermand and Gaëtan Mouveroux of France (left) led the second squad with 3195 (213.00 avg. 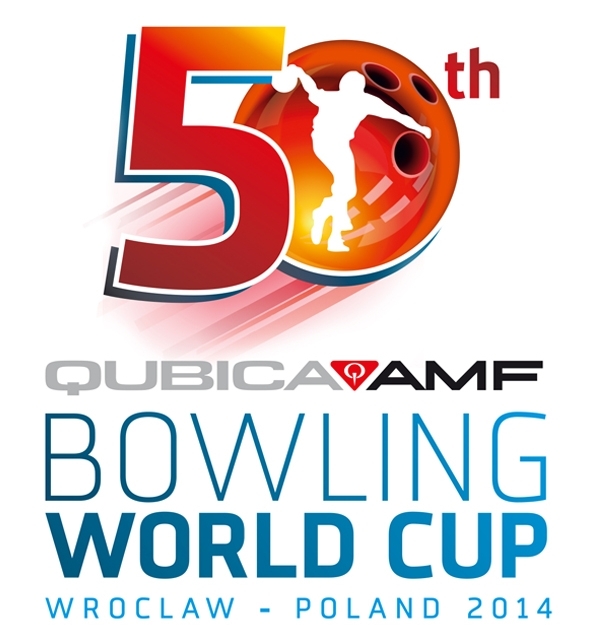 ), including games of 1094, 1019 and 1082 to sit in second place, mere five pins behind the Germans. 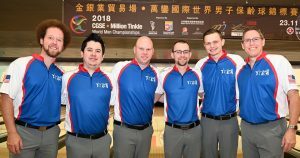 Mouveroux led the team with 713. 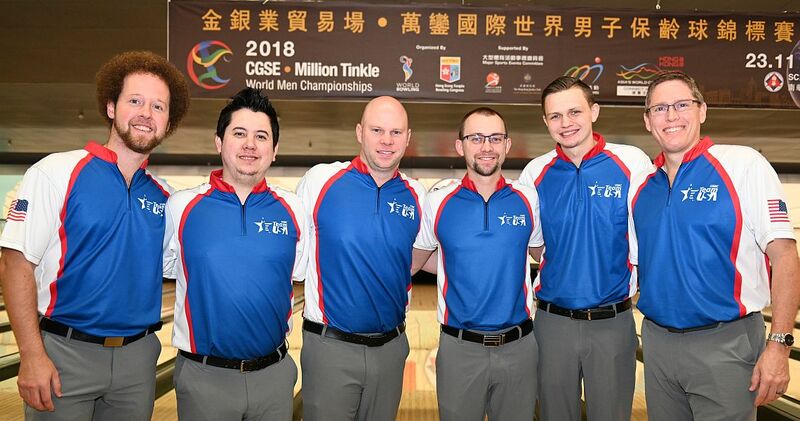 EJ Tackett, Kyle Troup, Jakob Butturff, Andrew Anderson and Tommy Jones of the United States (right), the defending champion in the team event, improved every game, posting scores of 974, 1063 and 1154, the highest game of the day, for a 3191 total. 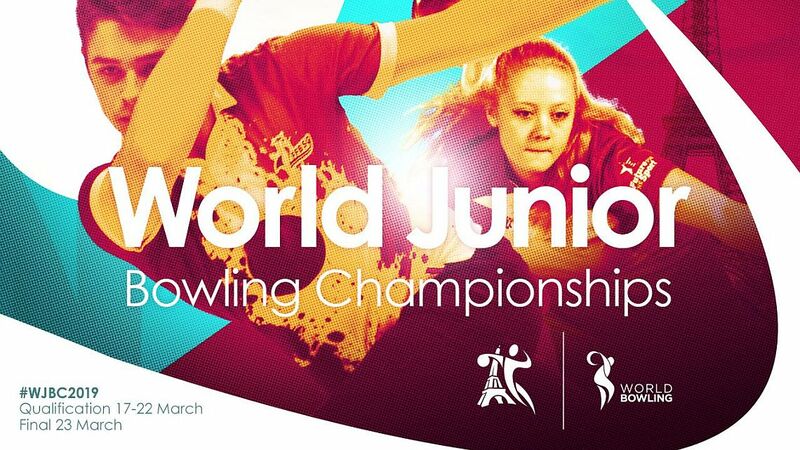 Jones led the way with 689. 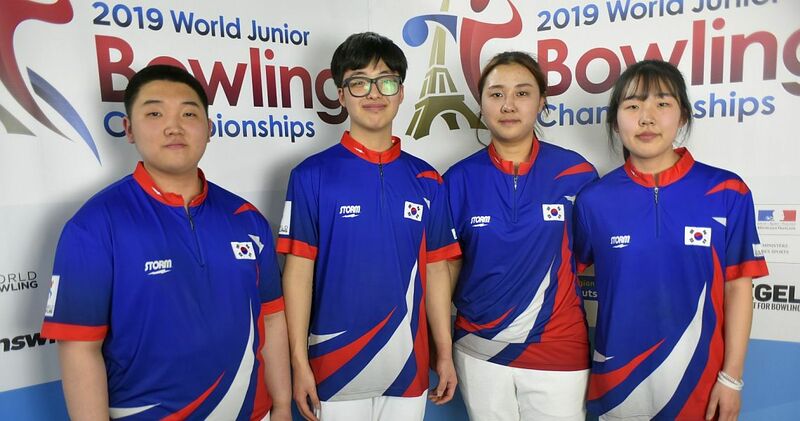 Ryan Lalisang, Hengki, Yeri Ramadona, Billy Islam and Hardy Rachmadian of Indonesia (left) round out the top 4 with 3084 and an average of 205.60. 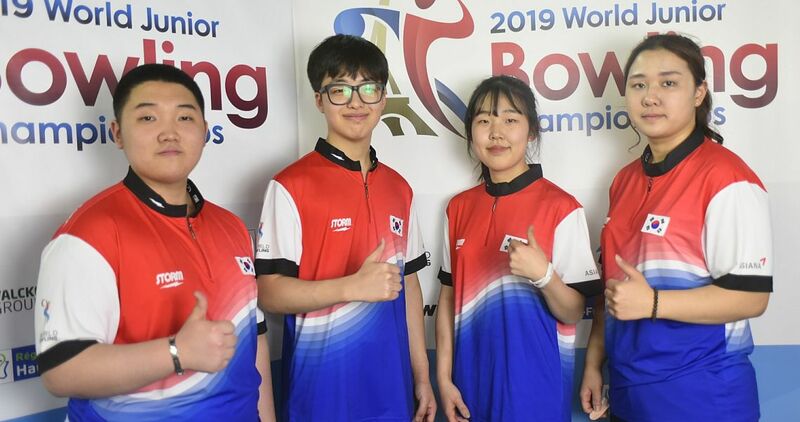 The top four after the six-game preliminaries will advance to the medal round on Tuesday, Dec 4. 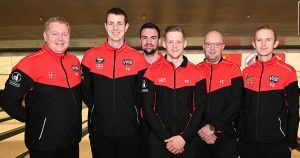 Denmark (right) was mere three behind Indonesia in fifth place with 3081, with Italy further 10 pins back in sixth place with 3071. 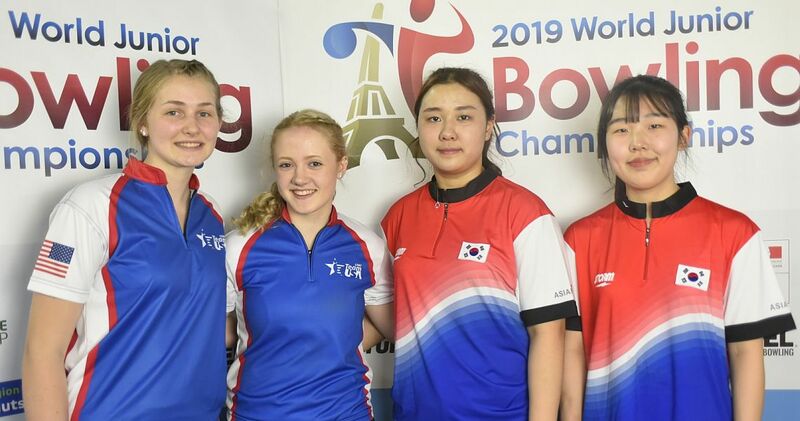 Sweden, which was second after the first block with 3068, slipped to seventh place and was followed by the Netherlands with 3040 in eighth place. 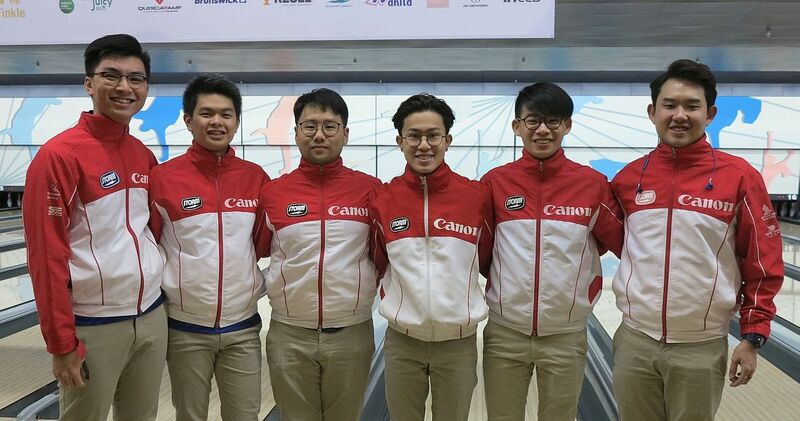 Singapore fell from third to ninth place with 3035. 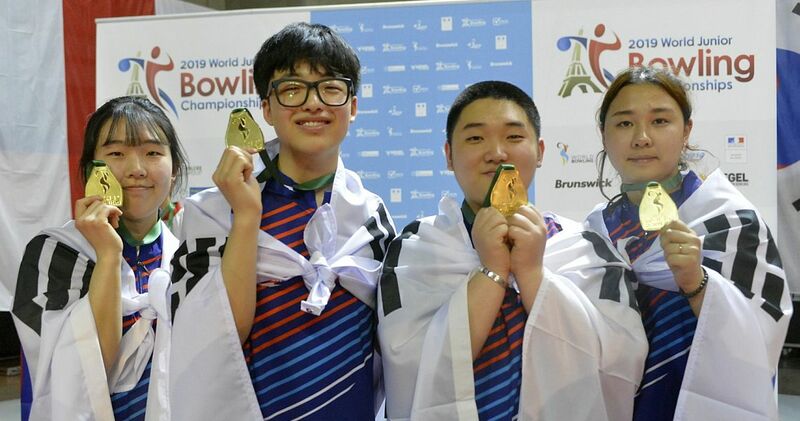 Korea (below right), the team champion at the last World Men Championships in Abu Dhabi, UAE, in 2014, has some work to do in order to qualify for the medal round. 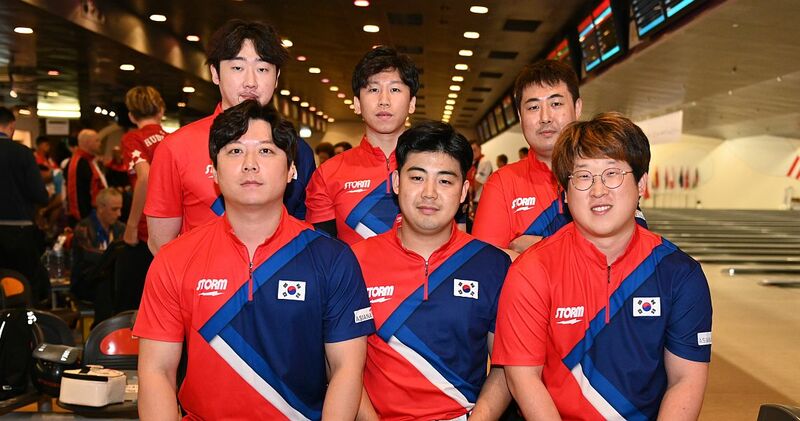 Park Jongwoo, Kim Kyungmin, Kang Heewon, Choi Bokeum and Hong Haesol, who were on the gold medal team in 2014, and World Championship newcomer Koo Seonghoi, who won the team gold at the 18th Asian Games Jakarta Palembang 2018, finished the first block in 10th place with 3028, 56 pins off the pace for the top 4. 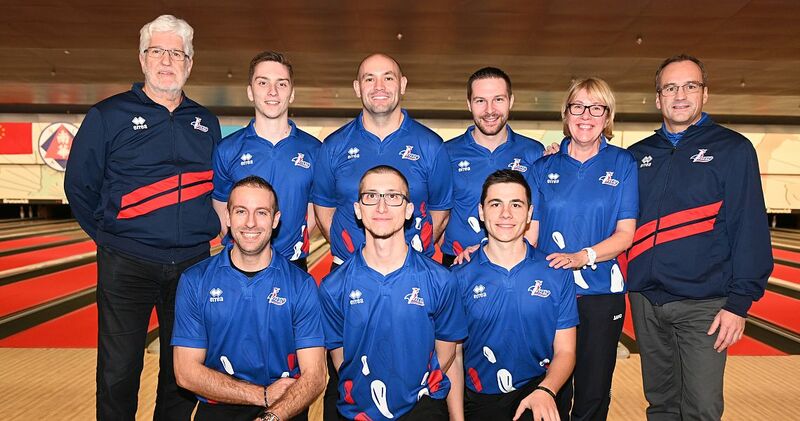 The top 26 teams (26th place went to Australia with 2819; 187.93) after three games now will have a day off. 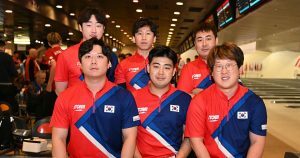 The bottom portion of the field will return to the lanes Sunday for its final three games, and the leaders will complete the preliminaries Monday afternoon. Through 21 games, EJ Tackett (from left), USA, leads in all-events (total pinfall in singles, doubles, trios and team event) with a 4670 total, a 222.38 average. 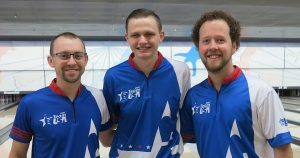 He is followed by his team mates Andrew Anderson (4664) and Kyle Troup (4,647). 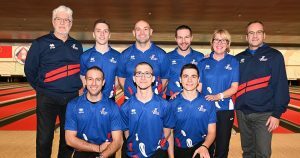 The top 24 bowlers from the all-events standings will advance to match play Masters, which concludes the Championships Wednesday, Dec. 5. 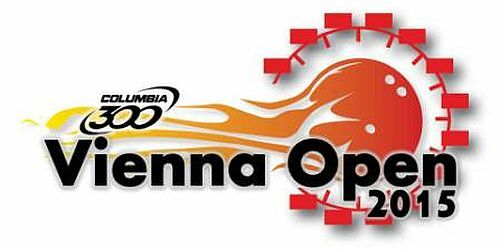 Denmark’s Carsten Warming Hansen and Napatra Buspaikonkul Thailand are tied for the 24th place with 4374, a 208.29 average. Prior to the Masters finals, the medal rounds in Singles (Dec. 1), Doubles (Dec. 2), Trios (Dec. 3) and in the Team event (Dec. 4) will be staged at SCAA bowling center and broadcasted live on I-Cable TV in Hong Kong and livestreamed to the U.S. and Canada.